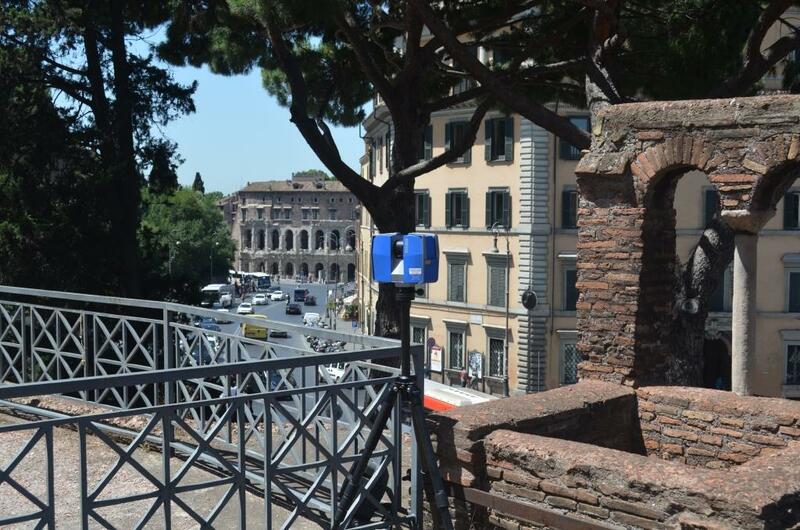 In July of this year Archaeovision member James Miles conducted a laser scan survey of the Insula Dell’ara Coeli which is situated in the centre of Rome at the base of the Capitoline Hill. The building dates to the second century AD and is one of the best preserved examples of a Roman brick-built apartment building. 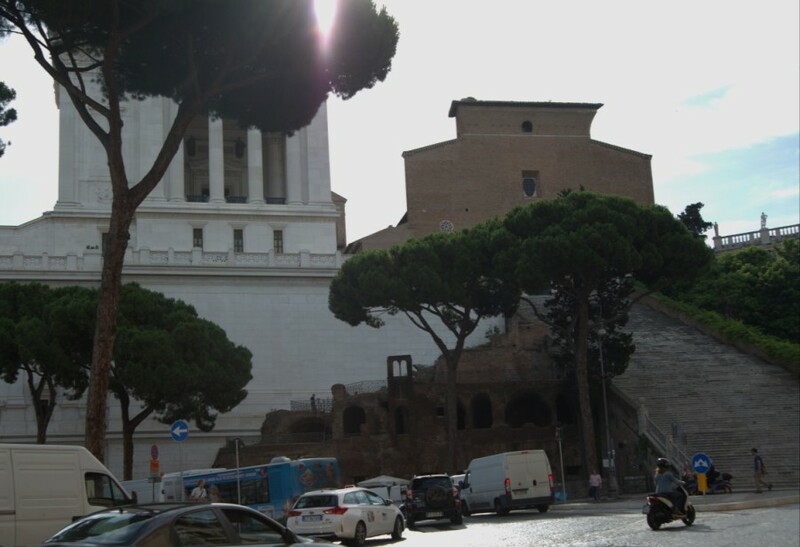 It was saved from demolition in the 1920s when the Altare della Patria (wedding cake) was constructed. The building has undergone many uses with the upper floors becoming part of the church of San Biagio de Mercato in the eleventh century which then later had the church of Santa Rita da Cascia in Campitelli built on top of it in 1665 by Carlo Fontana. It is originally thought that the building had six floors with five floors now remaining. The completed work was organised by Dr. Dragana Mladenović of the University of Southampton’s Archaeology department. The aim of the recording was to create a detailed documentation of the building in order to understand its difficult layout. Although survey work has been completed on this building, it was felt that laser scanning would offer a far superior record as it not only offers high resolution data but it enables a visual representation through a virtual interaction. 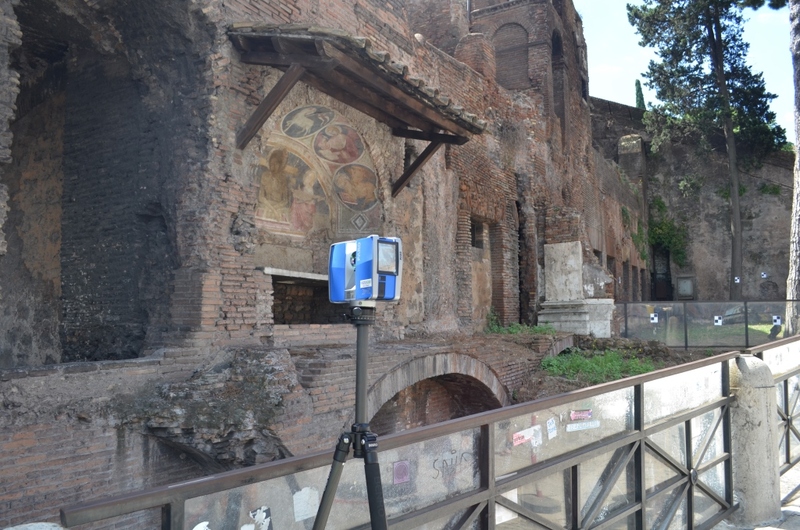 Archaeovision has a long running association with the Faro Focus 3D and this project utilised the updated x330. The phase scanner allows for the capture of data at distances from 0.6m to 330m. It allows for indoor and outdoor capture with low ambient light and normal incidence to a 90% reflective surface at a maximum recording rate of 976,000 points per second. It has a horizontal field of view of 360° and a vertical field of view of 305°. It incorporates a dual axis compensator with an accuracy of 0.015° and a range of ±5°; a height sensor which detects the height relative to a fixed point via an electronic barometer; an electronic compass which gives each scan a necessary north orientation and a GPS device which enables each scan to be georeferenced. In total 205 scans were completed of the building with both external and internal features recorded. The individual scans have since been processed and registered and the final model contains a very high resolution of data with several billion points recorded. Archaeovision are now in the process of finalising the model for a detailed analysis and whilst the work is ongoing no renders or animations will be released. Work is ongoing with this project and the results will be shown in future publications. Laser scanning was the best suited technology in recording this type of building and it is hoped that with this example more work will be carried out on similar Roman buildings. Whilst on site Archaeovision also completed a high resolution data capture of the Fresco found on the front façade. This was completed using a mosaic imaging capture similar to gigapan imaging.